Speed is crawling - streaming videos from youtube, 3news and stuff website require constant buffering. Anyone else have the same issue tonight? I am on vdsl - restart the router a few times. Good sync speed at 30/10. Test to speedtest usually I can get the maximum speed but tonight only 7/5. 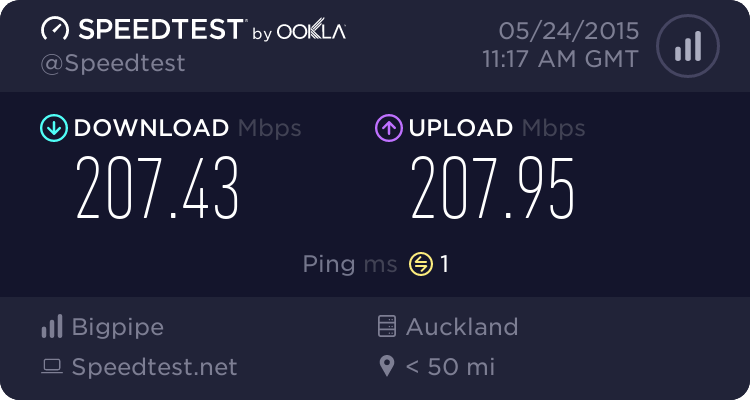 Yes I have noticed that too tonight, AKL ADSL, things are still working fine but noticeable lag loading sites and especially on youtube. Did a speed test, getting roughly half normal speed. Going fine for me tonight here in Dannemora! Been streaming Blu-ray rips from my mates house via Plex all afternoon and been fine. Gone through over 120 GB today. tek: Going fine for me tonight here in Dannemora! The speeds over the weekend were pretty bad here too. But Bagpipe say they've got Chorus looking into it. In your last thread, you also have issue with sync reduced. The sync has stayed the same for me. For the last 5 months, I have no issue whatsoever. Excellent HD streaming for Amazon/Netflix/1080p youtube. Last night I can't stream HD netflix, or even watching youtube at 480p. I have logged the issue. If no improvement, I will just try different ISP soon. I am quick at jumping between ISPs. Slow last night like you would not believe... 40ms ping and 5Mbps, yes, 5Mbps down and 8Mbps up on VDSL... syncing at 30Mbps. Came right after about 11:30pm. Now I'm back to 5ms, 26/9Mbps. quebec's issues seems different you are right. With the people having slowdowns, we're pretty confident it's a chorus issue with some of their gear being overloaded. If, for example, it is congestion at your local cabinet or exchange this may mean that switching ISPs won't help. We've heard from Spark and VF that they are seeing similar issues at the moment too. Thanks for logging the issue though - it all helps. BigPipeNZ: ..... With the people having slowdowns, we're pretty confident it's a chorus issue with some of their gear being overloaded. If, for example, it is congestion at your local cabinet or exchange this may mean that switching ISPs won't help. I honestly doubt it is the local cabinet/exchange - 150m radius, the suburb is fiber-ready. I expect more and more people moving away from xdsl to ufb nowadays. Like I said, last 5 months has been perfect. nakedmolerat: Speed is crawling - streaming videos from youtube, 3news and stuff website require constant buffering. I'm on VDSL and I have the same sync and am having the same issues - ping and download have gone to hell for the last few evenings. I've logged a support ticket with BigPipe. Right now I'm getting 4.8Mbps/8.6Mbps and 43ms. I'm also a Truenet volunteer with one of their probes so this isn't going to help BigPipe maintain its excellent VDSL position. Whether or not network problems are directly within their control or not is irrelevant - it's a good indicator of the performance in general. If there's a problem with the Chorus service they're reselling they need to supply their own gear or get Chorus onto sorting it. 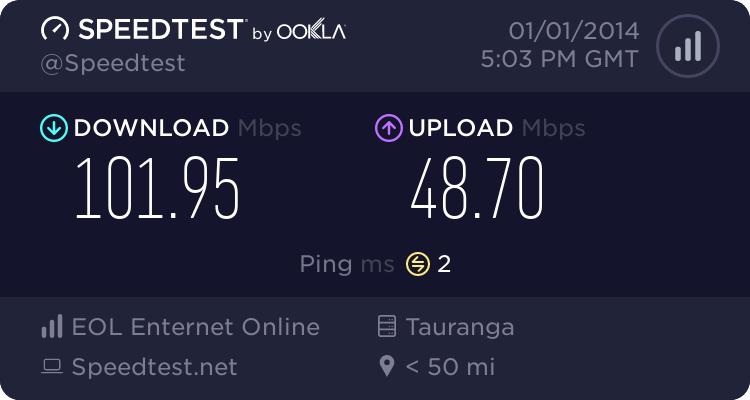 Last night speed did drop slightly and there was a disconnection. Weird. Never had this happen before. Just before someone jump in and talk about house wiring issue - our house is new - direct connection from outside. Cat 6 cable. This has been checked and confirmed by Chorus technician and also coffeebaron who completed the cabling to each room. I have posted an update in the other thread. please continue discussion in there so we can keep it all in one place.